Orpheus (/ˈɔːrfiəs, ˈɔːrfjuːs/; Ancient Greek: Ὀρφεύς, classical pronunciation: /or.pʰeú̯s/) is a legendary musician, poet, and prophet in ancient Greek religion and myth. 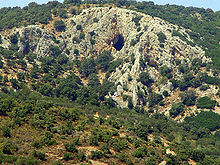 Some ancient Greek sources note Orpheus' Thracian origins. According to Tzeztes, his home was the Odrysian city of Bisaltia. The major stories about him are centered on his ability to charm all living things and even stones with his music, his attempt to retrieve his wife, Eurydice, from the underworld, and his death at the hands of those who could not hear his divine music. As an archetype of the inspired singer, Orpheus is one of the most significant figures in the reception of classical mythology in Western culture, portrayed or alluded to in countless forms of art and popular culture including poetry, film, opera, music, and painting. For the Greeks, Orpheus was a founder and prophet of the so-called "Orphic" mysteries. He was credited with the composition of the Orphic Hymns and the Orphic Argonautica. Shrines containing purported relics of Orpheus were regarded as oracles. Several etymologies for the name Orpheus have been proposed. A probable suggestion is that it is derived from a hypothetical PIE root *h₃órbʰos "orphan, servant, slave" and ultimately the verb root *h₃erbʰ- "to change allegiance, status, ownership". Cognates could include Greek ὄρφνη (órphnē) "darkness", and surely Greek ὀρφανός (orphanós) "fatherless, orphan", from which comes English "orphan" by way of Latin. Fulgentius, a mythographer of the late 5th to early 6th century AD, gave the unlikely etymology meaning "best voice," "Oraia-phonos". The earliest literary reference to Orpheus is a two-word fragment of the sixth-century BC lyric poet Ibycus: onomaklyton Orphēn ("Orpheus famous-of-name"). He is not mentioned in Homer or Hesiod. Most ancient sources accept his historical existence; Aristotle is an exception. Pindar calls Orpheus "the father of songs" and identifies him as a son of the Thracian king Oeagrus and the Muse Calliope. Some sources credit Orpheus with further gifts to mankind: medicine, which is more usually under the auspices of Aesculapius or Apollo; writing, which is usually credited to Cadmus; and agriculture, where Orpheus assumes the Eleusinian role of Triptolemus as giver of Demeter's knowledge to mankind. Orpheus was an augur and seer; he practiced magical arts and astrology, founded cults to Apollo and Dionysus and prescribed the mystery rites preserved in Orphic texts. Pindar and Apollonius of Rhodes place Orpheus as the harpist and companion of Jason and the Argonauts. Orpheus had a brother named Linus, who went to Thebes and became a Theban. He is claimed by Aristophanes and Horace to have taught cannibals to subsist on fruit, and to have made lions and tigers obedient to him. Horace believed, however, that Orpheus had only introduced order and civilization to savages. According to Apollodorus and a fragment of Pindar, Orpheus' father was Oeagrus, a Thracian king, or, according to another version of the story, the god Apollo. His mother was the (1) muse Calliope, (2) her sister Polymnia, (3) a daughter of Pierus, son of Makednos or (4) lastly of Menippe, daughter of Thamyris. His birthplace and place of residence was in Pimpleia close to the Olympus. Strabo mentions that he lived in Pimpleia. According to the epic poem Argonautica, Pimpleia was the location of Oeagrus' and Calliope's wedding. While living with his mother and her eight beautiful sisters in Parnassus, he met Apollo, who was courting the laughing muse Thalia. Apollo, as the god of music, gave Orpheus a golden lyre and taught him to play it. Orpheus' mother taught him to make verses for singing. He is also said to have studied in Egypt. Orpheus is said to have established the worship of Hecate in Aegina. In Laconia Orpheus is said to have brought the worship of Demeter Chthonia and that of the Kóres Sōteíras (Greek Κόρες Σωτείρας "Saviour Maidens"). [clarification needed] Also in Taygetus a wooden image of Orpheus was said to have been kept by Pelasgians in the sanctuary of the Eleusinian Demeter. According to Diodorus Siculus, Musaeus of Athens was the son of Orpheus. 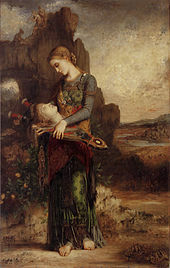 The story in this form belongs to the time of Virgil, who first introduces the name of Aristaeus (by the time of Virgil's Georgics, the myth has Aristaeus chasing Eurydice when she was bitten by a serpent) and the tragic outcome. Other ancient writers, however, speak of Orpheus' visit to the underworld in a more negative light; according to Phaedrus in Plato's Symposium, the infernal gods only "presented an apparition" of Eurydice to him. In fact, Plato's representation of Orpheus is that of a coward, as instead of choosing to die in order to be with the one he loved, he instead mocked the gods by trying to go to Hades to bring her back alive. Since his love was not "true"—he did not want to die for love—he was actually punished by the gods, first by giving him only the apparition of his former wife in the underworld, and then by being killed by women. 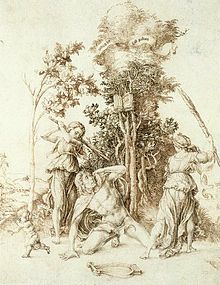 In Ovid's account, however, Eurydice's death by a snake bite is incurred while she was dancing with naiads on her wedding day. According to a Late Antique summary of Aeschylus' lost play Bassarids, Orpheus, towards the end of his life, disdained the worship of all gods except the sun, whom he called Apollo. One early morning he went to the oracle of Dionysus at Mount Pangaion to salute his god at dawn, but was ripped to shreds by Thracian Maenads for not honoring his previous patron (Dionysus) and buried in Pieria. Here his death is analogous with that of Pentheus, who was also torn to pieces by Maenads; and it has been speculated that the Orphic mystery cult regarded Orpheus as a parallel figure to or even an incarnation of Dionysus. Both made similar journeys into Hades, and Dionysus Zagreus suffered an identical death.Pausanias writes that Orpheus was buried in Dion and that he met his death there. He writes that the river Helicon sank underground when the women that killed Orpheus tried to wash off their blood-stained hands in its waters. had abstained from the love of women, either because things ended badly for him, or because he had sworn to do so. Yet, many felt a desire to be joined with the poet, and many grieved at rejection. Indeed, he was the first of the Thracian people to transfer his affection to young boys and enjoy their brief springtime, and early flowering this side of manhood. His head and lyre, still singing mournful songs, floated down the River Hebrus into the sea, afterwhich the winds and waves carried them to the island of Lesbos, at the city of Methymna; there, the inhabitants buried his head and a shrine was built in his honour near Antissa; there his oracle prophesied, until it was silenced by Apollo. 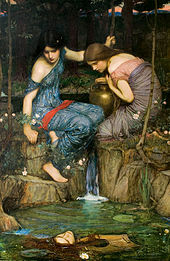 In addition to the people of Lesbos, Greeks from Ionia and Aetolia consulted the oracle, and his reputation spread as far as Babylon. Orpheus' lyre was carried to heaven by the Muses, and was placed among the stars. 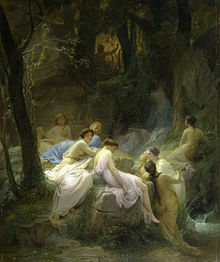 The Muses also gathered up the fragments of his body and buried them at Leibethra below Mount Olympus, where the nightingales sang over his grave. After the river Sys flooded Leibethra, the Macedonians took his bones to Dion. Orpheus' soul returned to the underworld, to the fields of the Blessed, where he was reunited at last with his beloved Eurydice. Another account relates that he was struck with lightning by Zeus for having lied about the stories and the mysteries of the gods. 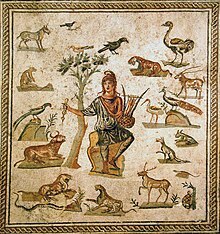 A number of Greek religious poems in hexameters were attributed to Orpheus, as they were to similar miracle-working figures, like Bakis, Musaeus, Abaris, Aristeas, Epimenides, and the Sibyl. Of this vast literature, only two works survived whole: the Orphic Hymns, a set of 87 poems, possibly composed at some point in the second or third century, and the epic poem Argonautica, composed somewhere between the fourth and sixth centuries. Earlier Orphic literature, which may date back as far as the sixth century BC, survives only in papyrus fragments or in quotations. Some of the earliest fragments may have been composed by Onomacritus. The historian William Mitford wrote in 1784 that the very earliest form of a higher and more cohesive ancient Greek religion was manifest in the Orphic poems. W. K. C. Guthrie wrote that Orpheus was the founder of mystery religions and the first to reveal to men the meanings of the initiation rites. The Orpheus motif has permeated Western culture and has been used as a theme in all art forms. Early examples include the Breton lai Sir Orfeo from the early 13th century and musical interpretations like Jacapo Peri's Euridice (1600, though titled with his wife's name, the libretto is based entirely upon books X and XI of Ovid's Metamorphoses and therefore Orpheus' viewpoint is predominant). Subsequent operatic interpretations include Claudio Monteverdi's L'Orfeo (1607), Luigi Rossi's L'Orfeo (1647), Christoph Willibald Gluck's Orfeo ed Euridice (1762), Joseph Haydn's last opera L'anima del filosofo, ossia Orfeo ed Euridice (1791), Franz Liszt's symphonic poem Orpheus (1854), Igor Stravinsky's ballet Orpheus (1948) and two operas by Harrison Birtwistle: The Mask of Orpheus (1973–1984) and The Corridor (2009). The Bulgarian Rousse State Opera commissioned and performed Orpheus: A Masque by John Robertson. It debuted in 2015. Vinicius de Moraes' play Orfeu da Conceição (1956), later adapted by Marcel Camus in the 1959 film Black Orpheus, tells the story in the modern context of a favela in Rio de Janeiro during Carnaval. Jean Cocteau's Orphic Trilogy – The Blood of a Poet (1930), Orpheus (1950) and Testament of Orpheus (1959) – was filmed over thirty years, and is based in many ways on the story. Philip Glass adapted the second film into the chamber opera Orphée (1991), part of a homage triptych to Cocteau. Nikos Nikolaidis' 1975 film Evrydiki BA 2O37 is an innovative perspective on the classic Greek tragedy of Orpheus and Eurydice. Anaïs Mitchell's 2010 'folk opera' musical Hadestown retells the tragedy of Orpheus and Eurydice with a soundtrack inspired by American blues and [jazz], portraying Hades as the brutal work-boss of an underground mining city. 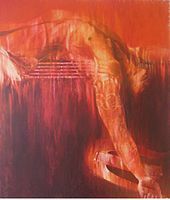 Dino Buzzati adapted the Orpheus motif in his graphic novel Poem Strip (1969). Neil Gaiman depicts his version of Orpheus in The Sandman comics series (1989–2015). Gaiman's Orpheus is the son of Oneiros (the Dream Lord Morpheus) and the muse Calliope. 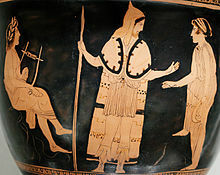 ^ Fritz Graf and Sarah Iles Johnston, Ritual Texts for the Afterlife: Orpheus and the Bacchic Gold Tablets (Routledge, 2007), p. 167, while taking note of depictions in Greek art, particularly vase painting, that show Orpheus attired as a Greek, often in contrast to those in Thracian dress around him. ^ Cf. "Ὀρφανός" in: Etymological Dictionary of Greek, ed. Robert S. P. Beekes (Ph. D. 1969). First published online October 2010. Consulted online on 03/05/2018. ^ Ibycus, Fragments 17 (Diehl); M. Owen Lee, Virgil as Orpheus: A Study of the Georgics State University of New York Press, Albany (1996), p. 3. ^ Kathleen Freeman, Ancilla to the Pre-Socratic Philosophers, Harvard University Press (1948), p. 1. ^ Aristotle (1952). W. D. Ross; John Alexander Smith (eds.). The Works of Aristotle. XII – Fragments. Oxford: Clarendon Press. p. 80. ^ Pseudo-Apollodorus, Bibliotheke 1.3.2, Argonautica 1.23, and the Orphic Hymn 24,12. ^ Pseudo-Apollodorus, Bibliotheke 1.3.2; Euripides, Iphigeneia at Aulis, 1212 and The Bacchae, 562; Ovid, Metamorphoses 11: "with his songs, Orpheus, the bard of Thrace, allured the trees, the savage animals, and even the insensate rocks, to follow him>"
^ Others to brave the nekyia were Odysseus, Theseus and Heracles; Perseus also overcame Medusa in a chthonic setting. ^ A single literary epitaph, attributed to the sophist Alcidamas, credits Orpheus with the invention of writing. See Ivan Mortimer Linforth, "Two Notes on the Legend of Orpheus", Transactions and Proceedings of the American Philological Association 62, (1931):5–17). ^ a b Apollodorus (Pseudo Apollodorus), Library and Epitome, 1.3.2. "Orpheus also invented the mysteries of Dionysus, and having been torn in pieces by the Maenads he is buried in Pieria." ^ Apollodorus, Library and Epitome, 2.4.9, This Linus was a brother of Orpheus; he came to Thebes and became a Theban. ^ William Godwin (1876). "Lives of the Necromancers". p. 44. ^ a b Strabo, Geography, Book 7, Chapter 7: "At the base of Olympus is a city Dium. And it has a village near by, Pimpleia. Here lived Orpheus, the Ciconian, it is said — a wizard who at first collected money from his music, together with his soothsaying and his celebration of the orgies connected with the mystic initiatory rites, but soon afterwards thought himself worthy of still greater things and procured for himself a throng of followers and power. Some, of course, received him willingly, but others, since they suspected a plot and violence, combined against him and killed him. And near here, also, is Leibethra." ^ Gregory Nagy, Archaic Period (Greek Literature, Volume 2), ISBN 0-8153-3683-7, p. 46. ^ Index in Eustathii commentarios in Homeri Iliadem et Odysseam by Matthaeus Devarius, p. 8. ^ Pausanias, The Description of Greece, 6.20.18: "A man of Egypt said that Pelops received something from Amphion the Theban and buried it where is what they call Taraxippus, adding that it was the buried thing which frightened the mares of Oenomaus, as well as those of every charioteer since. This Egyptian thought that Amphion and the Thracian Orpheus were clever magicians, and that it was through their enchantments that the beasts came to Orpheus, and the stones came to Amphion for the building of the wall. The most probable of the stories in my opinion makes Taraxippus a surname of Horse Poseidon." ^ Son of Oeagrus or Apollo and Calliope: Apollodorus 1.3.1. ^ Pindar, frag. 126, line 9, noted in Kerényi 1959: 280. 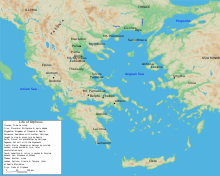 ^ In Pausanias, Graeciae Descriptio 9.30.4, the author claimed that "... There are many untruths believed by the Greeks, one of which is that Orpheus was a son of the Muse Calliope, and not of the daughter of Pierus." ^ William Keith Guthrie and L. Alderlink, Orpheus and Greek Religion (Mythos Books), 1993, ISBN 0-691-02499-5, p. 61 f.: "[…] is a city Dion. Near it is a village called Pimpleia. It was there they say that Orpheus the Kikonian lived." ^ a b Jane Ellen Harrison, Prolegomena to the Study of Greek Religion (Mythos Books), 1991, ISBN 0-691-01514-7, p. 469: "[…] near the city of Dium is a village called Pimpleia where Orpheus lived." ^ The Argonautica, book I (ll. 23–34), "First then let us name Orpheus whom once Calliope bare, it is said, wedded to Thracian Oeagrus, near the Pimpleian height." ^ Hoopes And Evslin, The Greek Gods, ISBN 0-590-44110-8, ISBN 0-590-44110-8, 1995, p. 77: "His father was a Thracian king; his mother the muse Calliope. For a while he lived on Parnassus with his mother and his eight beautiful aunts and there met Apollo who was courting the laughing muse Thalia. Apollo was taken with Orpheus, gave him his little golden lyre and taught him to play. And his mother taught him to make verses for singing." ^ Pausanias, Description of Greece, Corinth, 2.30.1 : "Of the gods, the Aeginetans worship most Hecate, in whose honor every year they celebrate mystic rites which, they say, Orpheus the Thracian established among them. Within the enclosure is a temple; its wooden image is the work of Myron, and it has one face and one body. It was Alcamenes, in my opinion, who first made three images of Hecate attached to one another, a figure called by the Athenians Epipurgidia (on the Tower); it stands beside the temple of the Wingless Victory." ^ Pausanias, Description of Greece, Laconia, 3.14.1,: "[…] but the wooden image of Thetis is guarded in secret. The cult of Demeter Chthonia (of the Lower World) the Lacedaemonians say was handed on to them by Orpheus, but in my opinion it was because of the sanctuary in Hermione that the Lacedaemonians also began to worship Demeter Chthonia. The Spartans have also a sanctuary of Serapis, the newest sanctuary in the city, and one of Zeus surnamed Olympian." ^ Pausanias, Description of Greece, Laconia, 3.13.1: "Opposite the Olympian Aphrodite the Lacedaemonians have a temple of the Saviour Maid. Some say that it was made by Orpheus the Thracian, others by Abairis when he had come from the Hyperboreans." ^ Pausanias, Description of Greece, Laconia, 3.20.1,: "Between Taletum and Euoras is a place they name Therae, where they say Leto from the Peaks of Taygetus […] is a sanctuary of Demeter surnamed Eleusinian. Here according to the Lacedaemonian story Heracles was hidden by Asclepius while he was being healed of a wound. In the sanctuary is a wooden image of Orpheus, a work, they say, of Pelasgians." ^ Katherine Crawford (2010). The Sexual Culture of the French Renaissance. Cambridge University Press. p. 28. ISBN 978-0-521-76989-1. ^ John Block Friedman (2000-05-01). Orpheus in the Middle Ages. Syracuse University Press. p. 9. ISBN 978-0-8156-2825-5. ^ M. Owen Lee, Virgil as Orpheus: A Study of the Georgics, State University of New York Press, Albany (1996), p. 9. ^ "The Georgics of Virgil: Fourth Book". www.sacred-texts.com. Retrieved 11 July 2017. ^ Robert Graves, The Greek Myths, Penguin Books Ltd., London (1955), Volume 1, Chapter 28, "Orpheus", p. 115. ^ Apollonius of Rhodes, Argonautica, book III: "Let no footfall or barking of dogs cause you to turn around, lest you ruin everything", Medea warns Jason; after the dread rite, "The son of Aison was seized by fear, but even so he did not turn round..." (Richard Hunter, translator). ^ Classical Mythology, p. 279, Mark P. O. Morford, Robert J. Lenardon. ^ Pausanias, Description of Greece, Boeotia, 9.30.1. The Macedonians who dwell in the district below Mount Pieria and the city of Dium say that it was here that Orpheus met his end at the hands of the women. Going from Dium along the road to the mountain, and advancing twenty stades, you come to a pillar on the right surmounted by a stone urn, which according to the natives contains the bones of Orpheus. ^ Patricia Jane Johnson (2008). Ovid Before Exile: Art and Punishment in the Metamorphoses. University of Wisconsin Press. p. 103. ISBN 978-0-299-22400-4. "by the Ciconian women." ^ Ovid, trans. A. S. Kline (2000). Ovid: The Metamorphoses. Book XI. ^ Heinrich Wölfflin (2013). Drawings of Albrecht Dürer. Courier Dover Publications. pp. 24–25. ISBN 978-0-486-14090-2. ^ Carlos Parada "His head fell into the sea and was cast by the waves upon the island of Lesbos where the Lesbians buried it, and for having done this the Lesbians have the reputation of being skilled in music." ^ Flavius Philostratus, Life of Apollonius of Tyana, 4.14. ^ William Godwin (1876). "Lives of the Necromancers". p. 46. ^ Pausanias, Description of Greece, Boeotia, 9.30.1  Immediately when night came the god sent heavy rain, and the river Sys (Boar), one of the torrents about Olympus, on this occasion threw down the walls of Libethra, overturning sanctuaries of gods and houses of men, and drowning the inhabitants and all the animals in the city. When Libethra was now a city of ruin, the Macedonians in Dium, according to my friend of Larisa, carried the bones of Orpheus to their own country. ^ Others have said that his wife died before him, and that for her sake he came to Aornum in Thesprotis, where of old was an oracle of the dead. He thought, they say, that the soul of Eurydice followed him, but turning round he lost her, and committed suicide for grief. The Thracians say that such nightingales as nest on the grave of Orpheus sing more sweetly and louder than others.Pausanias, Description of Greece, Boeotia, 9.30.1. ^ Freeman, Kathleen. Ancilla to the Pre-Socratic Philosophers, Harvard University Press (1948), p. 1. ^ Plato. The Republic 364c–d. ^ Moore, p. 56: "the use of eggs and beans was forbidden, for these articles were associated with the worship of the dead". ^ Janko, Richard (2006). Tsantsanoglou, K.; Parássoglou, G.M. ; Kouremenos, T. (eds.). "The Derveni Papyrus". Bryn Mawr Classical Review. Studi e testi per il 'Corpus dei papiri filosofici greci e latini'. Florence: Olschki. 13. ^ Mitford, p. 89: "But the very early inhabitants of Greece had a religion far less degenerated from original purity. To this curious and interesting fact, abundant testimonies remain. They occur in those poems, of uncertain origin and uncertain date, but unquestionably of great antiquity, which are called the poems of Orpheus or rather the Orphic poems [Note: Particularly in the Hymn to Jupiter, quoted by Aristotle in the seventh chapter of his Treatise on the World]; and they are found scattered among the writings of the philosophers and historians." The idea of a religion "degenerated from original purity" expressed an Enlightenment idealisation of an assumed primitive state that is one connotation of "primitivism" in the history of ideas. ^ Guthrie, pp. 17–18. 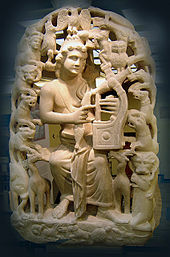 "As founder of mystery-religions, Orpheus was first to reveal to men the meaning of the rites of initiation (teletai). We read of this in both Plato and Aristophanes (Aristophanes, Frogs, 1032; Plato, Republic, 364e, a passage which suggests that literary authority was made to take the responsibility for the rites)". Guthrie goes on to write about "This less worthy but certainly popular side of Orphism is represented for us again by the charms or incantations of Orpheus which we may also read of as early as the fifth century. Our authority is Euripides. We have already noticed the 'charm on the Thracian tablets' in the Alcestis and in Cyclops one of the lazy and frightened Satyrs, unwilling to help Odysseus in the task of driving the burning stake into the single eye of the giant, exclaims: 'But I know a spell of Orpheus, a fine one, which will make the brand step up of its own accord to burn this one-eyed son of Earth' (Euripides, Cyclops 646 = Kern, test. 83)." ^ Rousse State Opera. "Световна премиера на операта „Орфей” от канадския композитор Джон Робъртсън в МФ „Сцена край реката”-Русе" ("World Premiere of the opera "Orpheus" by Canadian composer John Robertson"). Retrieved 22 February 2016 (in Bulgarian). ^ Isherwood, Charles (2007-06-19). "The Power of Memory to Triumph Over Death". New York Times. ^ Gaiman, Neil. The Sandman #50. Orphicorum fragmenta, Otto Kern (ed. ), Berolini apud Weidmannos, 1922.